Originally, St. Gregorios Orthodox Church started as a mission parish of the North American, Canadian, and European Diocese of the Malankara Orthodox Syrian Church of India. The mission was established 1984 in Spokane, Washington by H. G. Dr. Thomas Mar Makarios. About 80 people attended the first liturgy of the new mission in a local Anglican church. 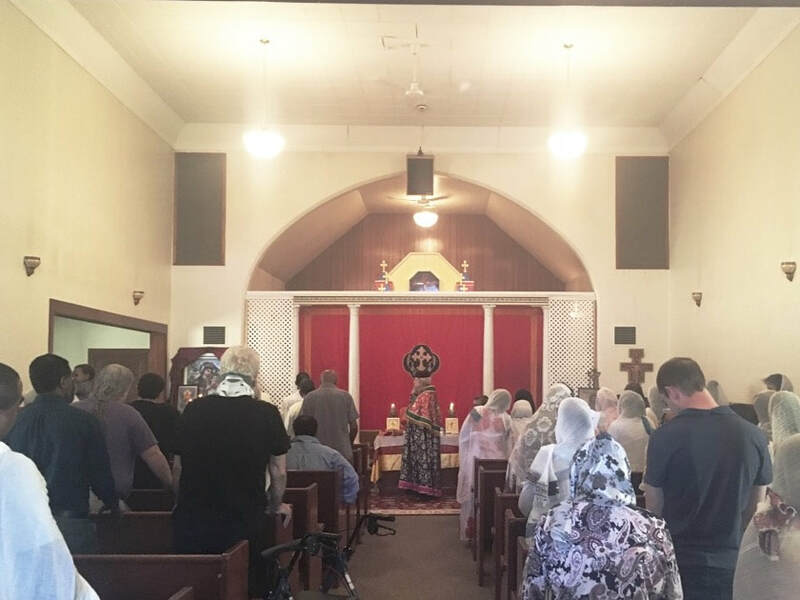 In addition to the bishop’s occasional visits, a few other priests visited the Spokane mission to celebrate Holy Qurbana (Holy Liturgy) and to provide for the spiritual needs of the new community. In June of 1987, Very Rev. Fr. Michael Hatcher was ordained to the deaconate and another member of our mission, Rev. Fr. James Pike of blessed memory, was ordained to a minor order of the deaconate. The first home of the new mission was a rented Anglican church in the Hillyard area of Spokane. After a year, St. Gregorios moved to an old building on Fort Wright College Campus. Since St. Gregorios was the only Oriental Orthodox parish in the Spokane area, the mission soon began to serve a variety of Oriental Orthodox Christians, as well as a small but steady stream of converts to the church. St. Gregorios Orthodox Church purchased several acres on the edge of the city in the early 1990’s. However, property development costs were such that the church finance committee decided to explore other options. In October 2002, after 15 years of renting a total of four different locations, St. Gregorios obtained its own building in the Corbin Park area of Spokane. This has been a major development in the life of the parish. The former St. Matthew’s Episcopal Church has been converted into our church upon its consecration on September 18, 2004. In 2011, St. Gregorios was granted official status from a Mission to a Church congregation within the South-West American Diocese of the Malankara Orthodox Syrian Church of India. In January 2017, St. Gregorios parish was able to purchase a new building on the east side of Spokane. The building, a former Methodist church, is still under renovation and fits for our ever growing church body. The consecration of the building will be set at a future date. Now comprising around 70 families, St. Gregorios Orthodox Church has been steadily growing. There are over nine languages spoken in the parish. The people of the parish come from America, India, Ethiopia, Eritrea, Greece, Lebanon, Jordan, Turkey, Egypt, Mexico, Pakistan, Syria, and Guatemala among other places. All Church services are conducted primarily in English but include portions in Syriac and Malayalam. Syriac is a dialect of Aramaic, the language spoken by Jesus Christ and his apostles, and is the ancient liturgical language of Syriac Christians of Middle Eastern and Indian heritage. Malayalam is the vernacular of Kerala in South India, the historical home of Indian Orthodoxy. One unique experience offered in the Holy Qurbana (Holy Liturgy), is to hear the "Our Father" in multiple languages on any given Sunday. St. Gregorios has become a unique community and a diverse family of Oriental Orthodox Christians. to join multiple cultures worshiping God together.